This course is designed to fulfill licensing board or credentialing requirements for remedial education. It is specifically targeted toward healthcare professionals who prescribe controlled substances and those cited for inappropriate prescribing. The course is also suitable for healthcare professionals who wish to improve their comfort and skills managing patients on chronic controlled substances. 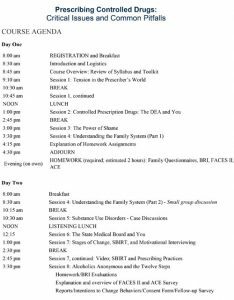 Participants in Prescribing Controlled Drugs (PCD) may also register for CPEP’s Basics of Chronic Pain Management seminar. This one-day seminar takes place immediately after the PCD course. While the regular fee for Basics of Chronic Pain Management is $550, PCD participants may register for only $250. For more information, click here. 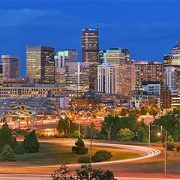 This course is offered three times per year in Denver, CO. Please Click Here for a list of available sessions. A list of the upcoming courses is available at the bottom of this page. The course is also offered at the Vanderbilt Center for Professional Health in Nashville, TN. Please Click Here for more information. How do I enroll in Prescribing Controlled Drugs? Enrolling in Prescribing Controlled Drugs is easy. Simply Click Here to access the registration page. What do past participants say about Prescribing Controlled Drugs? Who is eligible for Prescribing Controlled Drugs? 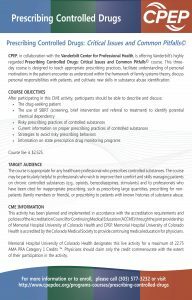 This course is open to all healthcare professionals who prescribe controlled substances. UCHealth Memorial Hospital designates this live activity for a maximum of 22.75 AMA PRA Category 1 Credits ™. Physicians should claim only the credit commensurate with the extent of their participation in the activity. This live activity, Prescribing Controlled Drugs: Critical Issues and Common Pitfalls, has been reviewed and is acceptable for up to 20.50 Prescribed credit(s) by the American Academy of Family Physicians (AAFP). Physicians should claim only the credit commensurate with the extent of their participation in the activity. CPEP would like to thank Pinnacol Assurance and the COPIC Medical Foundation for their generous support of our efforts to bring this important course to Denver. The majority of materials used in this course were originally developed by, and used with the permission of, the Vanderbilt Center for Professional Health. CPEP is pleased and privileged to work with Vanderbilt in making this important course more broadly available.